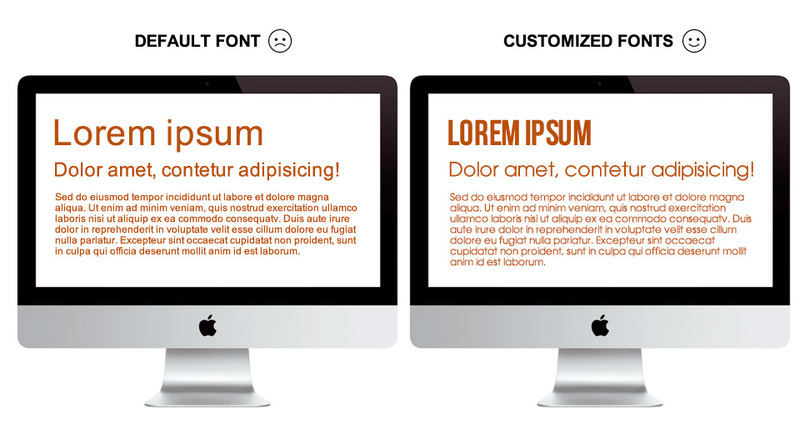 Is your website stuck with ugly default fonts? Are your tired of buying individual fonts just to have variety? Using cloud fonts is a great alternative to purchasing web safe fonts as well as using ugly default fonts. Cloud fonts are subscription based services that make thousands of fonts available for web use. These services not only expand your font library, but it comes at a fraction of the cost in comparison to purchasing a web safe font. It also provides certain benefits such as maintaining consistent visuals and enhancing website performance. The purchase of rights to use a customized web safe font can become very costly. Purchasing the rights of use is a permanent commitment. If you ever decide to change the font(s) on your website, you cannot just “return” it in exchange for another. You would need to purchase the rights again for your new font choice. With cloud fonts, you are purchasing the use of the library for a specific website so you have the luxury to swap out your font(s) as you please. Think “Buying versus Renting”. Being able to use a font that appropriately represents your company is essential to delivering the intended message. Fonts have personalities just like people! Fonts can be playful, serious, classy, masculine, and much more. A website’s overall feel is largely affected by the font used, so being able to deliver that visual for all users is fundamental in maintaining a consistent voice. With cloud fonts you have the flexibility to change as you or your designer pleases. There is a common alternative in the web industry to control typography, which some of you may have seen it before. It is an image with text in it, meaning, someone converted the font into a bitmap image and flattened it into the picture. There is no way to cut and paste the word. This is a very bad way to control typography for several reasons. First, it would slow down your page load speed because more images need to load. Second, it is not SEO friendly since search engines cannot read the font within the images. And third, it may affect the layout of your site by moving content around, causing misalignment due to the pixel size of your image. Cloud fonts deliver the file from their external website so all your website needs to do is read the link with no additional files. There are various companies that provides cloud font services such as typekit.com, typecast.com, myfonts.com and many more. The variety of companies available makes your choice to use cloud fonts even easier and more customized. This is the modern route to enhance the visuals on your website, optimize your website, and all at a cost efficient price!